Welch Blvd. 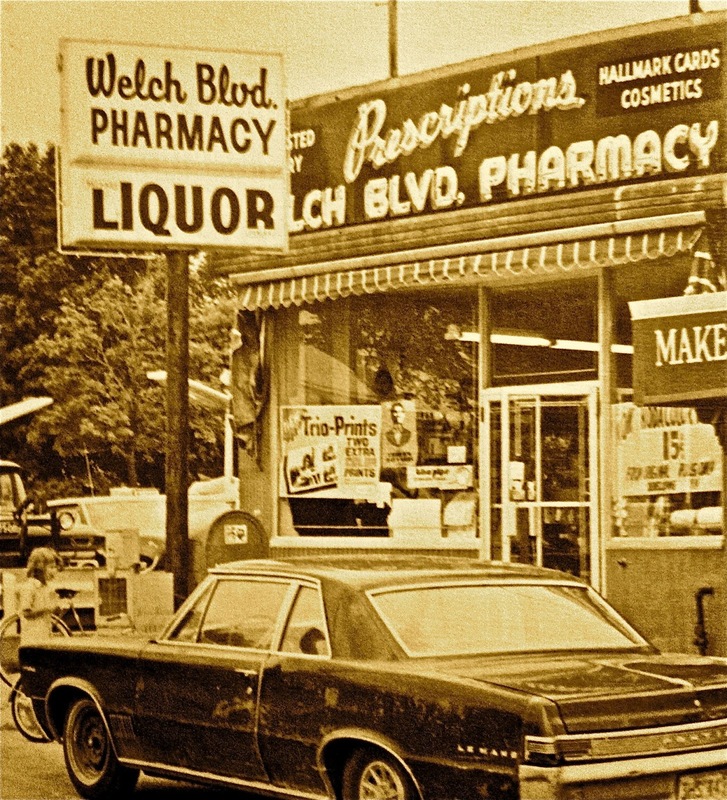 Pharmacy, a popular destination for neighborhood kids, at its original location near the corner of N. Chevrolet Avenue, sometime in the early seventies. 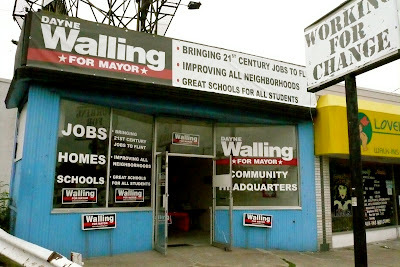 The storefront in 2009 when it was serving as a satellite campaign office for candidate and soon-to-be mayor Dayne Walling. Hmmm, I wonder why "LIQUOR" is the biggest word on the sign? Across the street from the "Della Theatre". Hey would it be possible when you post these to include the Google map so we can see what it looks like (today) and where it is (my geography isn't what it used to be). Spent a lot of time on this strip. Grampa got his scripts here after the place on Detroit Street became too far to walk. There was a five and dime to the right and it became more of a stop and rob over the years. 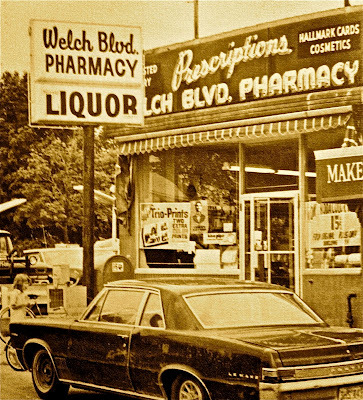 Then we flipped to the other side of the street for the drug store there (it may have replaced this one-Terry was the owner of the new one). Anita's was next door which was Luigi's Pizza when I was young. The theatre was gone and a bank with drive thru replaced it. Not a nice part of town anymore. When my dad died in 1995, we had stopped going for coffee everyday about a year or so before. It just wasn't safe and the bank was rubbed on regular basis as was the drug store and eatery. And at night, the take out pizza place and liquor store were scary. Even Baskin Robbins left the strip early on. Yikes at the Walling campaign promises. Don't forget the shoe repair shop and beer and wine behind the drug store...........can't think of their names now. Johnny's Shoe Repair behind the drug store on Stockdale is still there & thriving. I also remember the Saturday matinees at the Della & the Welch Blvd. hardware. Still living in the Civic park area & NOT going anywhere. Right on Dave; I wish more people had the balls to stay and fight for what's theirs. I moved into the city in 2004 (after most of my family white-flighted years before) and I'm not going anywhere either. Bowling for Dollars in San Francisco.